It’s always on Thanksgiving, when I’m cooking multiple dishes and my stovetop is full, that I wish I had a hot plate. Having that one extra burner would help with the puzzle of getting all the food out on the table at the same time, still hot. 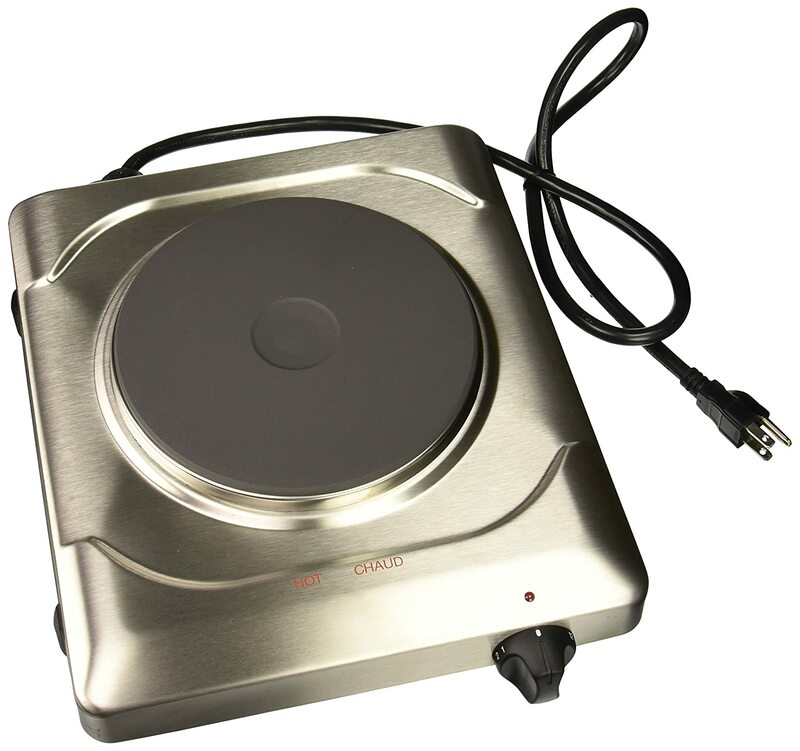 But there are a lot of options to consider when shopping for the best hot plate. In this article, I’ll cover everything you need to know about hot plates: uses, types, specs, and I’ll compare some of the best options out there. Feel free to go right to the listings of these products on Amazon by clicking the links below, to check reviews and current prices. Hot plates are one of those items that regularly pop up on lists of things to bring to your first college dorm. I didn’t get one, but I do remember that the one guy in our hallway who did have one was very popular! Hot plates make a great small stovetop for any small space living situation. They are also very useful for camping, either in an RV or when tenting it. Lastly, hot plates are useful even when you have a full stovetop in your home for use during big meal prep, when renovating your kitchen, or for use in tabletop cooking. Depending on the type of hot plate you get, you may also be able to use it in the event of power outages. Most hot plates consist of one or two heating elements in a compact unit. The primary distinction in different types of hot plates is whether they are electric, gas, or induction. Here’s a quick guide of how these differ, and what the benefits and drawbacks are to each type. What type of hot plate you buy really depends on your preferences and your existing set up. Maybe you already have an electric stovetop and would like a gas hot plate to experience some of the advantages of cooking over gas. Or perhaps you’re dying to try out induction and appreciate the safety aspect of this type of burner. With any of these types of hot plates, there are some things you’ll want to keep in mind when shopping. Most hot plates are a single burner, but there are two-burner options. The output of induction and electric burners is typically measured in watts. To do any serious cooking (pan-frying, boiling water, etc), you’ll want something that is at least about 1200 watts. Any lower and it’ll be more useful as a warming burner. Gas hot plates can typically reach higher temperatures than electric or induction, so if you’d like to use this particularly for high-heat cooking like searing or wok cooking, that’s something to consider. The output is typically measured in BTUs, and anything in the 12,000-15,000 range should be powerful enough for most cooking. Particularly with induction and electric, you get more versatility when you can control the power output rather than just relying on temperature settings, which are often inaccurate or hard to gauge properly. Adjustments of smaller increments will also give you more control. If you know you’re interested in an induction hot plate, I have already discussed portable induction cooktops at length. Read on for reviews of top-selling electric and gas hot plates. I’ll include the overview of my top pick for an induction cooktop here, too, for the sake of comparison. Cuinsinart is a trusted brand for all manner of kitchen tools and small appliances. This is a simple, straight-forward hot plate. The electrical element is encased in a cast iron plate, to help disperse the heat evenly and make clean up easier. Note that there’s both a Cusinart and a Waring version of this item, but they appear to be the same. This unit maxes out at 1300 watts. The simple interface includes an on light, a ready light, and a dial to control 6 power settings. The body is stainless steel and the cast iron burner is 7.5” in diameter. 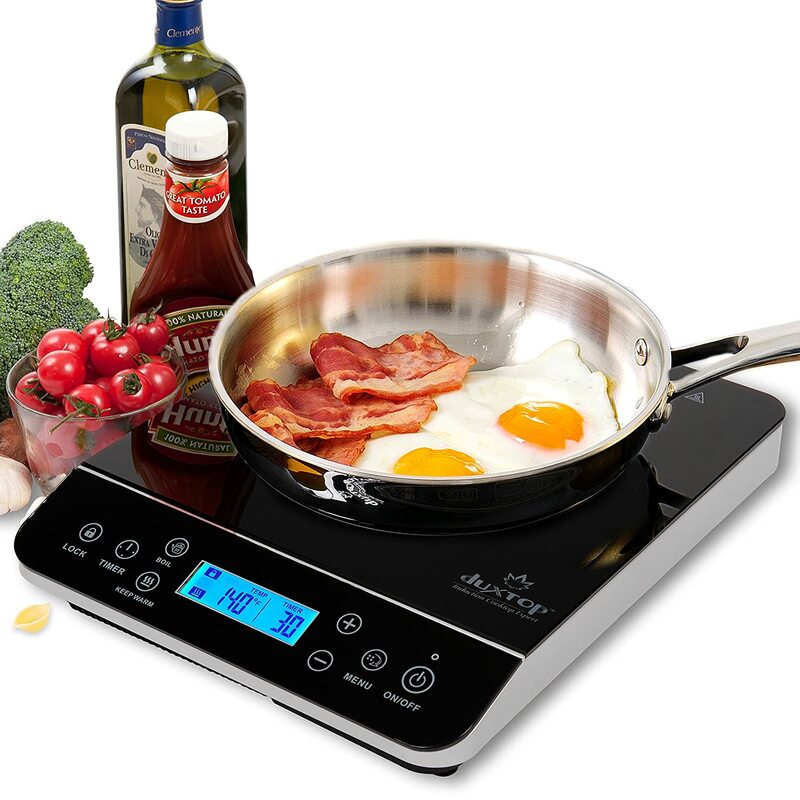 Most reviewers really love this hot plate. Many people comment that they’ve owned a number of hot plates and this is by far the best. What do users appreciate? People note that the build quality is very good—smooth dial, a heavy-duty cast iron plate over the element, nice finish on the body, powerful enough to even bring water to a boil. Some people report that the cast iron element takes a while to heat up but does retain heat well. However, any temperature adjustments take a while, so this can be challenging with delicate sauces, for example. Others note that the coating on the burner flakes off after a few uses, and some people had issues with the burner quitting after a few uses, or found that this hot plate wasn’t powerful enough to boil water or do any serious cooking. Given that many other reviewers didn’t experience these issues, I assume it’s an issue of quality control in the manufacturing. This hot plate is essentially the double burner version of the hot plate above. It has a 7.5” diameter burner with a 1300 watt capacity, and a 5” burner with a 500 watt capacity that is suitable primarily for warming. Otherwise, it’s essentially the same as the single burner unit in terms of controls and design. In terms of functioning as well, it seems similar. The majority of reviewers are very pleased and find that they can do a great deal of cooking on this burner. The smaller portion of buyers seem to have received faulty products that either didn’t work out of the box or stopped working properly after a fairly short amount of time. This Cadco unit is one that is frequently seen in restaurant supply shops and the like, and indeed it has a simple industrial look to it with the fully stainless steel body. The burner on this unit is a 8” exposed coil element. It has an on/off switch and a power light to indicate the burner is on. It also has a dial control for the power adjustment, which is smooth and allows for more precise (or as they call it, “infinite”) adjustment, rather than relying on power levels. The maximum power output is 1500 watts. Most reviewers really like this burner. People say it works just like a stovetop and have no issue doing any type of cooking with it, which is impressive for a portable unit like this. People also feel that the build quality is very good. Some people note that it can be difficult to clean food out from under the burner. The burner should pull out but it can apparently be difficult to do so without damaging the unit. Unlike the Cadco hot plate above, this one has a cast iron plate over the heating element and has a uncomplicated design with rounded corners on the stainless steel body. This has a simple dial and a single on light on top of the unit in front of the heating element. Many owners seem to be using this item for canning, an indication of its heavy duty construction (canning pots are heavy, especially when full of water and jars!) and power. One user has had this burner for 9 years and reports that it still works as well now as when it was first purchased. You should note that as with any cast iron burner, it is slow heat up and to respond to heat changes. A few reviewers also seemed to have issues with this unit right from the start, so definitely give it a test within the return window. 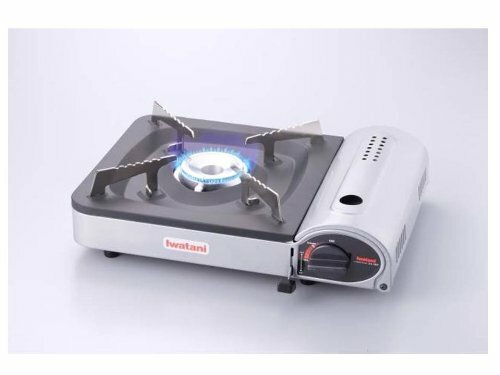 Iwatani is a Japanese company that manufactures a number of butane flame products suitable for traditional Japanese dishes such as hot plates. This is a powerful butane stove, more powerful than the typical camping stove, with 12,000 BTU output. It is certified for indoor use, though, so it’s not strictly meant as a camping unit. It does come with a plastic carrying case, though. As a self-contained hot plate, this can be used without an electrical outlet, such as for camping in the event of a power outage. One nice feature that sets this unit above lower end models is that it gently heats the fuel can to help deliver the last bit of fuel when the can is almost empty. This enables you to get the most use out of the can and help maintain a consistent flame. There is a huge number of reviews on this product, and the vast majority of them are positive. People find this is to be a powerful and well-built butane hot plate, capable of boiling water and doing other cooking tasks that less powerful burners can’t handle. Some users note that the flame is more consistent and responsive than lower output burners. Some people have issues with the connection from the gas to the element. While some users were able to fix this on their own, others were never able to get it to work properly. The other drawback is that as a powerful unit, you will go through butane canisters pretty quickly. For something that, in my opinion, looks a bit more permanent and has even more power and some added features such as a wind breaker, Iwatani makes the 15,000 BTU 35FW hot plate, but it is more expensive than this model. Duxtop is frequently recommended on discussion boards and blogs. This induction unit has one burner and a digital interface. 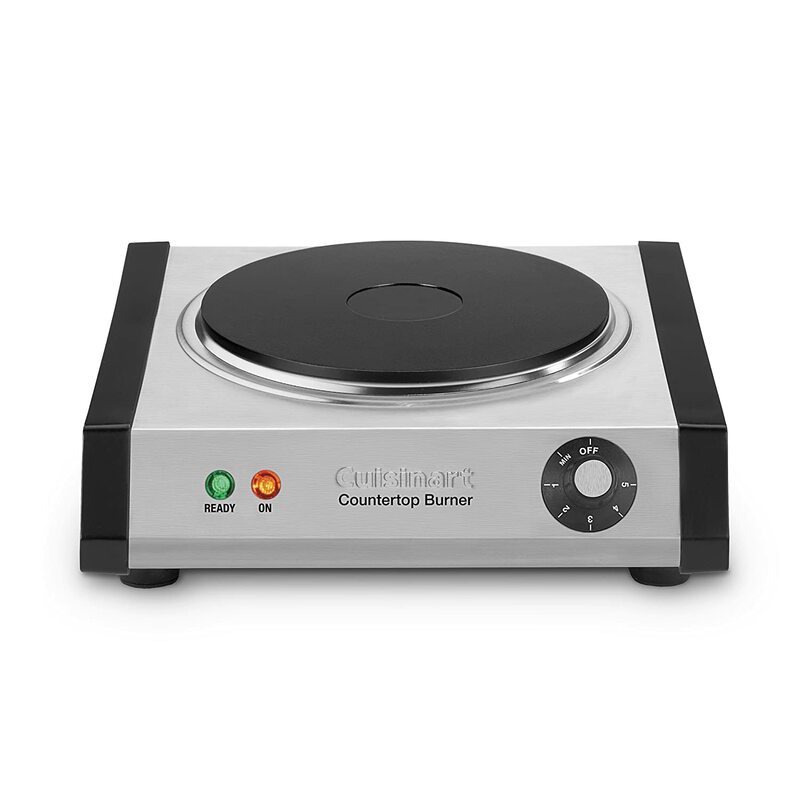 The burner is compatible with pans that have a minimum bottom diameter of 5 inches. There are some useful features in the uncomplicated interface, such as “keep warm” and “boil water” buttons. People generally have a good experience with this unit, especially given the price. Owners note that it’s important to read the instructions to become familiar with how this unit works. The temperature settings do tend to cycle on and off as the desired temperature is reached, which can be problematic for cooking things that require a constant temperature. The power settings, however, maintain a more constant temperature, and most users find that once they understand how the settings work, this cooktop works wonderfully and offers a lot of flexibility in how it operates. Some people do experience a high-pitched sound at high temperatures, which is more a function of the type of cookware than the cooktop. Other users are bothered by the power button, which requires being held down for about 2 seconds to turn the unit on. There are some excellent options for high performing hot plates, whatever your specific needs. If you know it’s induction you want, the Duxtop 9600LS offers a lot of features that give you very good control over the cooking process. 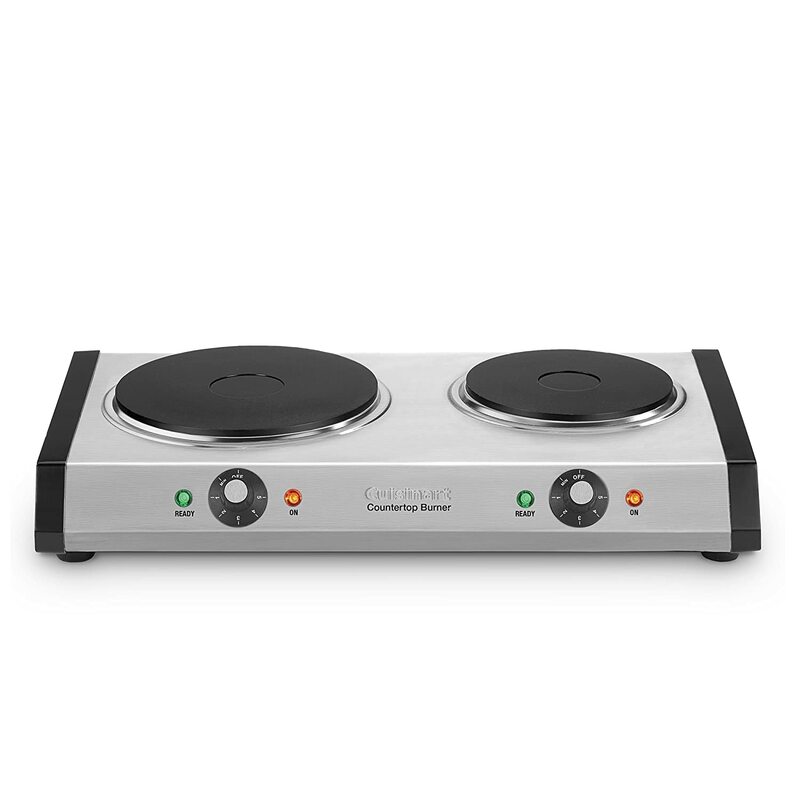 But if you don’t have induction compatible cookware and are more comfortable with the idea of an electric hot plate, the Cadco PCR-1S gets top marks for its heavy duty construction and power. 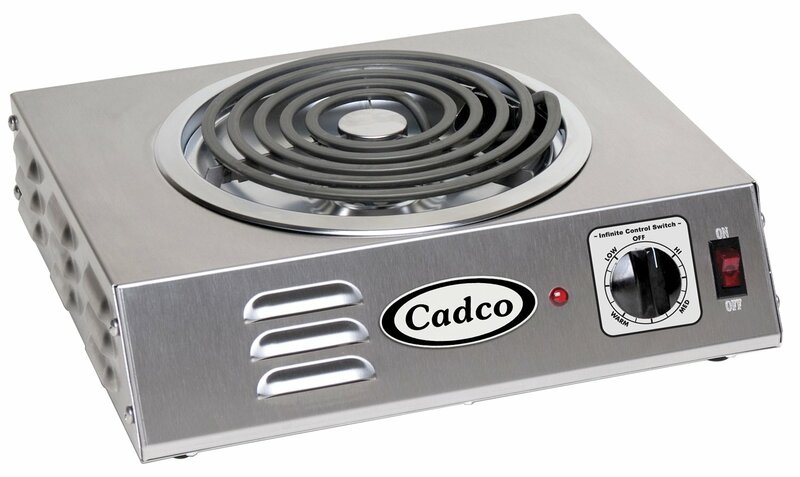 In general, the higher power output of the Cadco hot plates gives them an edge over the Cusinart hot plates. Given that I already have an electric stovetop, I’m very interested in the Iwatani butane burner hot plates. For a budget pick, the Iwatani ZA-3HP is a high rated option. For something a bit swankier looking that has a few added features, the Iwatani 35FW just may be what goes on my wish list! Do you have experience using a hot plate? What type do you favour?